The Craftsman 82007 (and 82008) is a multi-function, auto-ranging DMM. A compact – or mini – multimeter, it comes with several useful ranges, to include capacitance and frequency. It also has a temperature input and, as with many in this series by Craftsman, the 82007 ships with a voltage stick. In short, this is a good, affordable meter for occasional use and can appeal to electricians, technicians and those into HVAC. People like this tool because it’s a no mess meter with an easy to use interface. It is ideal for seasoned users as well as for beginners with its auto ranging capability and its extra ranges. These include temperature, capacitance and micro-amps, making it pretty useful for lighter HVAC tasks. Voltage detector: This is a handy device for those times when you want to quickly check if something is live. It is quite arbitrary in that you won’t be able to single out a cable within a bunch, but it can detect voltage in a wall or extension cord, for example. It picks up AC voltage only and also comes equipped with a 24V mode as well as a flashlight on the other end. Modes: Along with the inclusion of temperature and a dedicated micro-amps range, there are many other improvements over others in the 82000 series. There is a display hold, for one, which lets you pause the present reading on screen. In addition is a relative mode (or REL), where you can store a previous reading and compare with a following one. This can also double as a zero mode, cancelling the resistance in the probe leads. Range: There is also a range button, which lets you change from the default auto-ranging mode to manual ranging. To manual range, keep pressing the range button within a specific dial position. Craftsmans are quite well made. This is no Fluke, however, and may suffer when dropped from any sort of height, though it does have an integrated rubber boot where the corners are protected. It is ergonomic to the touch and the buttons are rubberized. Batteries and fuses are accessed from the rear. Display: Larger than most, the display on the Craftsman 82007 is easily read. It has a resolution to 4000 counts (3 3/4 digit) and refreshes around twice per second. While nice and clear, it is let down by the lack of a backlight. You’ll need to spend a bit more with Craftsman to get that. Labels: The labeling is straightforward (red against black), with mostly dedicated range positions, aside from the capacitance/resistance and the frequency/duty cycle positions. While there are separate fused inputs for the main terminal and high current, unfortunately the milliamp/micro-amp input is also shared with the voltage. Not a game changer, but not ideal. The Craftsman 82007 is said to perform quite quickly, including when auto-ranging. To speed up measurements further, you can use manual ranging, but would then need to select each range of course. There is an auto shutdown mode, which you typically don’t always find on cheaper multimeters. This will save battery life and kicks in after about 15 minutes of non-use. In addition is a warning message and beep if you have the lead plugged into current when switched to a voltage range, for instance. Cheap glass fuses provide a modicum of protection for the inputs. With the high current range, a circuit should not be tested for longer than 30 seconds in one hit, after which time you should let the meter cool down. This is a CAT-III-rated multimeter, so is capable of measuring mains directly and installations post-switch gear. 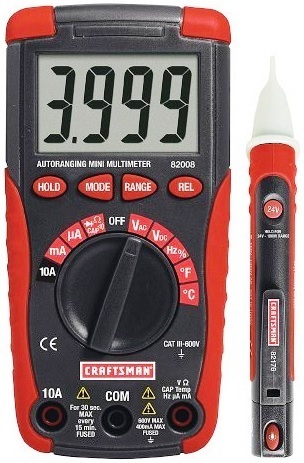 This is a good value for money multimeter by Craftsman. With the 82007 review, having most input ranges makes it a useful tool for many industries. It also has a category III level of surge protection, giving it more scope for where and what you can test. The display also has better resolution than some of the others in this range of meters, plus it is auto-ranging. Alternatives: The best selling Extech EX330 is a good, albeit more expensive, alternative.